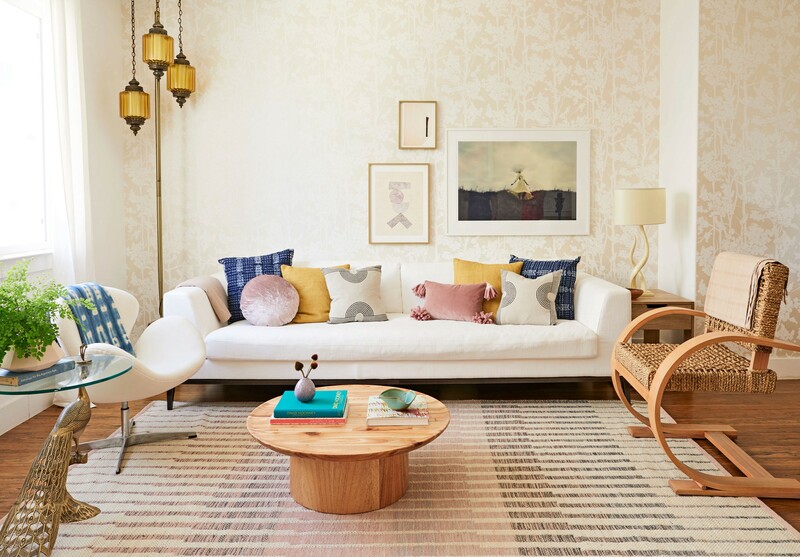 Interior designer Katrina Boschenko’s three-story Airbnb Plus home says serenity from the moment you walk in. Hidden Paths print, $109, and Tipping Point print, $254; minted.com. Daydreamer photo print, $1,200; ellehanley.com. Pure storage table, $349, Source Kudu table lamp, $179, and Linear ombré rug, $899 for 9'x12'; westelm.com. Blue pillows, ara-collective.com for similar. Round lush velvet pillow and silk hand-loomed pillow covers, $39 each; westelm.com; Magnet Linen pillows, $85 each; blockshoptextiles.com. 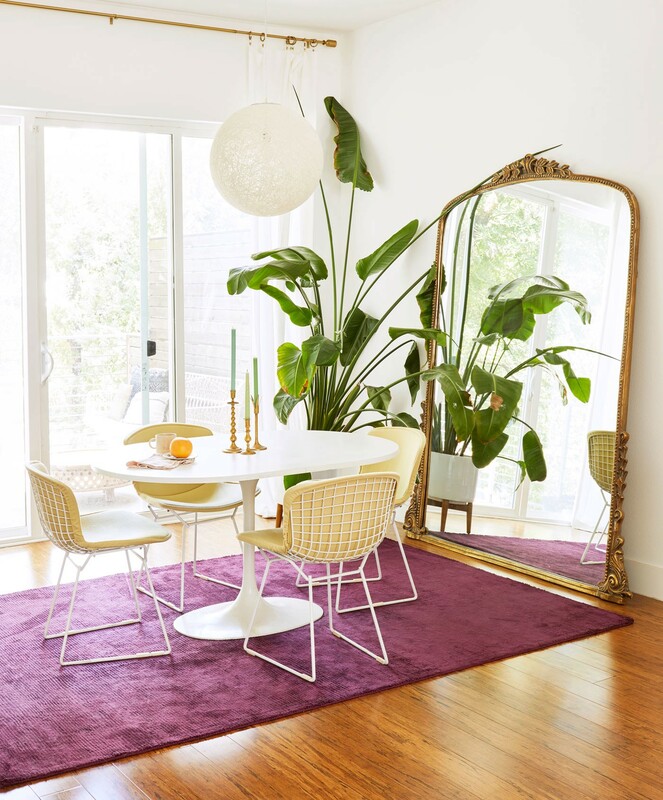 French Modernist armchair, $1,149; wisteria.com. SET IN EAST AUSTIN, walking distance from one of the city’s buzzy nightlife hubs, Katrina Boschenko’s townhouse belies none of the area’s boisterous energy. 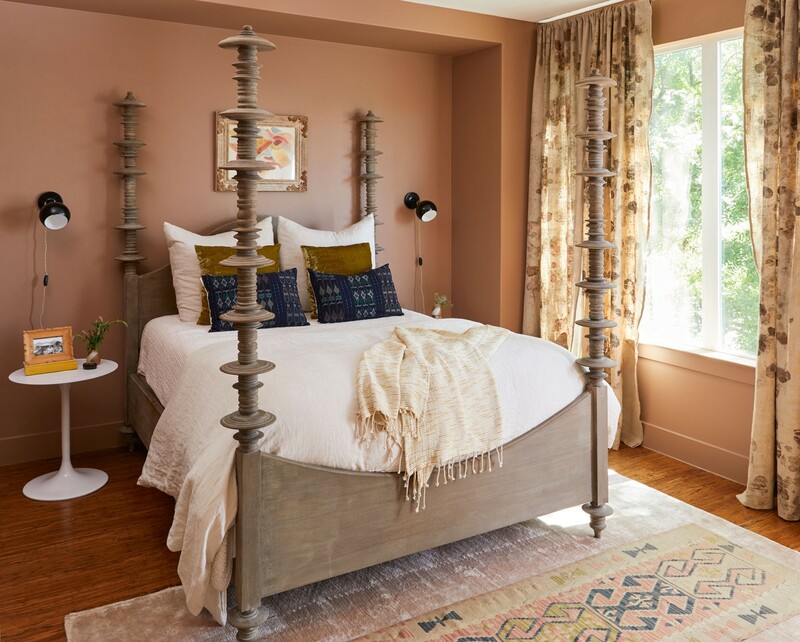 Instead, it’s a three-story Airbnb Plus oasis designed to be calming, with boho-style touches inspired by her favorite travel destinations, including Tulum and Bali. Subdued shades are the host’s go-to — “a natural environment is so soothing,” says the former tech director turned interior designer — but her approach to beige is anything but boring. 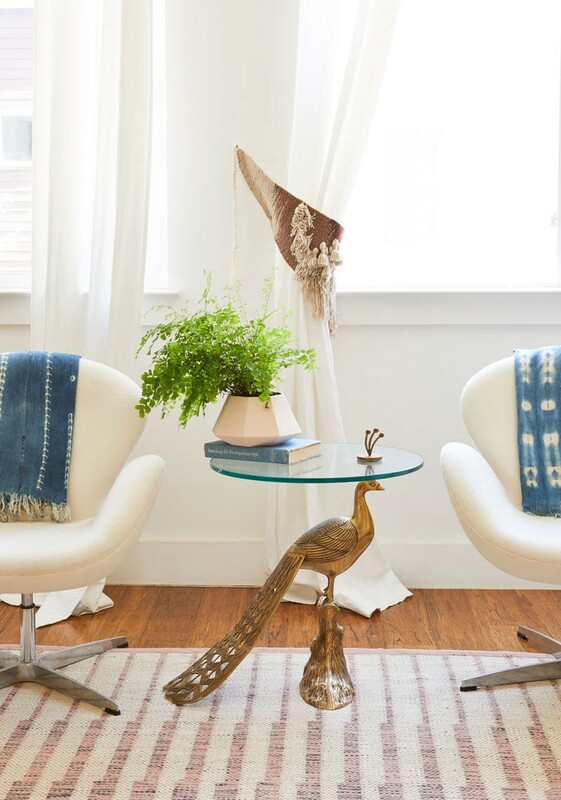 Think tone-on-tone pieces with tons of texture, and clean-lined modern accents paired with artful antiques passed down from family members or picked up on trips. The Climb print in coral, $466; minted.com. Wing series custom cantilevered shelf, edwoodstudios.com for info. Eames molded-plastic counter-height stools, $539 each; store.hermanmiller.com. Pendants, westelm.com for similar. 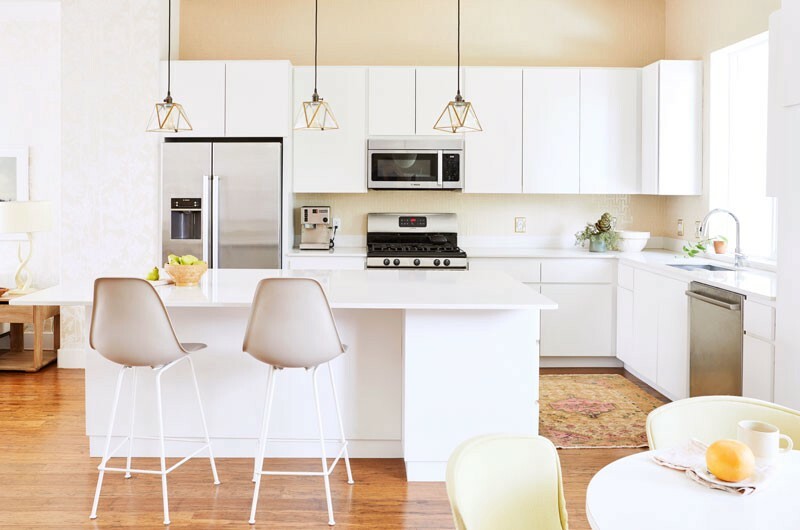 White cabinets plus floaty pendants equals a calming cookspace. String pendant, nestmodern.com for info. Gleaming Primrose 7-foot mirror, $1,348; anthropologie.com. Vintage table and chairs, chairish.com for similar. Joshua Tree in September print, $199, and Organics_9_2_A print, $89; minted.com. Otto woodblock print, $250; blockshoptextiles.com. Clint floor lamp, $329; westelm.com. Linen duvet cover set, $329; parachutehome.com. Forma pillow, $45; cb2.com. Black Chiapas throw, $155; ara-collective.com. Threshold faceted ceramic large lamp base, $38; target.com. This is the only room with a concrete floor, so Boschenko took the boho scheme in a slightly more rugged direction. 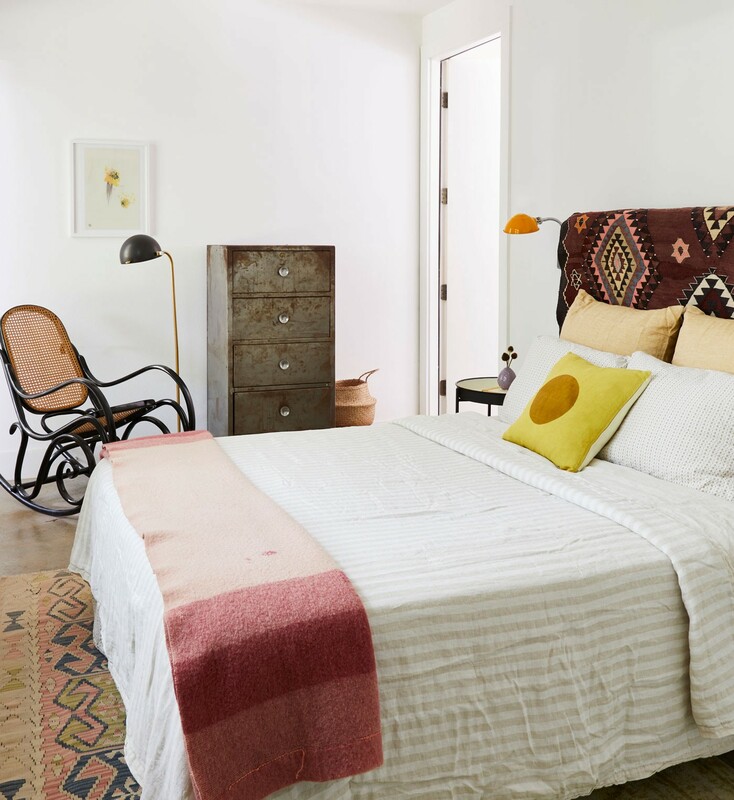 “I bought the weathered dresser on Craigs­list, the black rocker is a family heirloom, and the headboard is wrapped with a repurposed rug,” she says. Clint floor lamp, $329; westelm.com. Striped linen queen-size quilt, $279; parachutehome.com. Marigold pillow, $85; blockshop textiles.com. Vintage throw, chairish.com for similar. 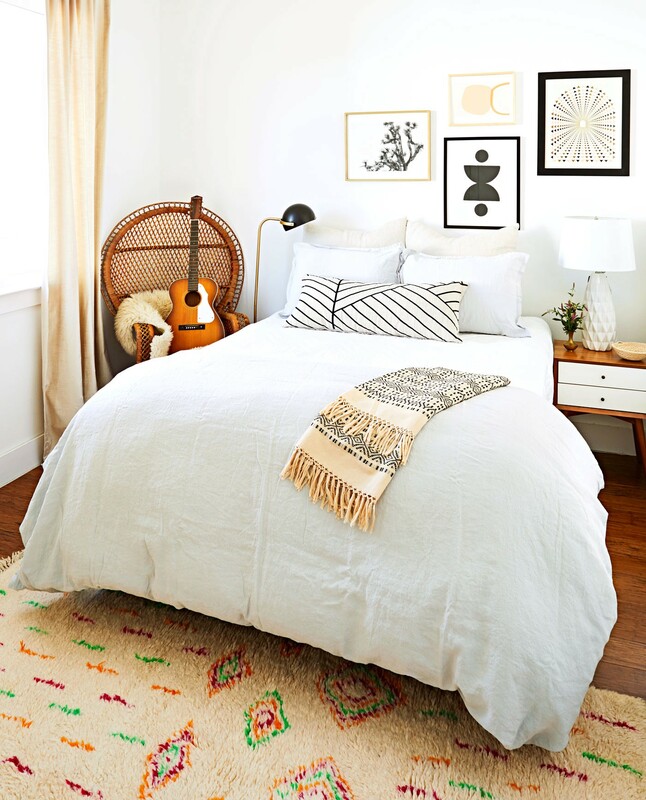 A big, scrolly bed gives this room an artsy vibe. 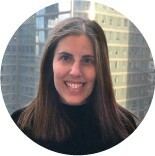 “The posts reminded me of tall spires from the Sagrada Família in Barcelona,” says Boschenko. To help a busy piece blend in, surround it with accents in similar shades (like the mocha walls, wood frame, and natural-dyed linen drapes here). Isaac plug-in short-arm sconces, $189 each; schoolhouse.com. Vintage Guatemalan pillow №14, $98 each; ara-collective.com. Woven Tala throw blanket, $68; anthropologie.com. Tulip side table, fourhands.com for info. Custom natural-dyed linen drapes by Wander Designs’ Textile Collective, wanderdesigns.net for info. A rich paint color sets a dreamy tone in a bedroom. “These walls used to be white, but a trip to Morocco prompted me to try an earthier shade. This one [Frontenac Brick by Benjamin Moore] feels like a big hug,” says Boschenko. 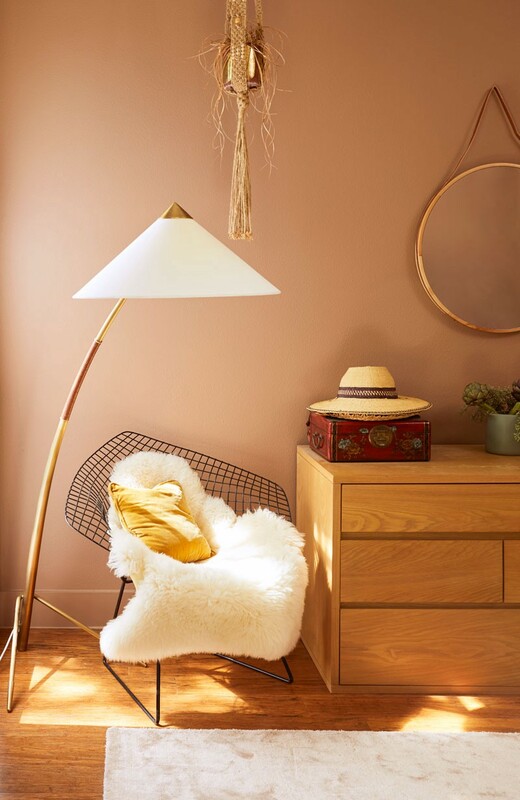 Set an arc lamp next to a sheepskin-topped seat, and you’ve got a restful reading spot. The yard’s pecan trees “are the big draw,” says Boschenko, so she went with all-white patio pieces that don’t compete for attention. Left: Modern hanging oversize mirror, $299; westelm.com.